The theme for this month's Mixology Monday (MxMo CVI) was picked by Joel DiPippa of the Southern Ash blog. The theme he chose was "Spring Break," and he elaborated on the concept with his description of, "As we look past the frost in the air for the arrival of Spring, I wanted to challenge you with the theme of Spring Break!.. The best part of Spring Break is that it means so many things to so many different people, so I have some high expectations this month. Yes, Tiki-heads, I am looking at you. I want all of you to dig deep, steeled by last month's MxMo, and find your spring break drink! What sort of drinks do you enjoy when you start to break out of your winter shell? Do you crave a return to gin and tonics? Is there a drink that calls to you as the weather warms and the sun creeps through the sky longer and longer? Perhaps there is a drink that you fondly recall from your days of being a callow youth on Spring Break that led you down this primrose cocktail path?.. This is the month to share those warm weather finds!" While wondering what to do for this Mixology Monday, the drink came to me by a need for a Valentine's Day drink for the Loyal Nine holiday menu. I wanted to do a Tiki drink for two that would help people not only romantically share a beverage but help to escape Winter itself. Actually, there were two special Tiki item menus as the cold weather the night before on the 13th depleted a whole week's worth of Hot Buttered Rum batter, and I decided to supplement the two servings left with the 1941 Hot Zombie for the chilly weather expected for the 14th. For the drink for two idea, I discovered that the biggest glass set we had was a 16 ounce "coupe/goblet" glass. The idea of trying my hand at a blender drink to fill this glass seemed promising, and luckily, the kitchen was kind enough to lend me one for the evening. My trial run the night before provided an interesting drink that I will publish in a few days, and I tweaked the recipe here to split the three rum blend to a mix of white rum and pisco and to swap out the Don's Spices #2 (equal parts vanilla syrup and allspice dram) for falernum. I debated between two names, and I decided that the earlier version would get the more Polynesian-inspired one, and this one would be dubbed "Queen of the Lava Beds." While that certainly sounds Hawaiian in its own right, the name is in reference to Lou Graham, a late 19th century madam that ran a successful bordello in the skid row (a/k/a lava beds) region of Seattle that I discovered through Boothby's Madame Lou cocktail. Blend with 3/4 cup (6 oz) crushed ice for 5-10 seconds, pour into a 16 oz glass (or Tiki mug), and top with crushed ice (around 1/4 cup). 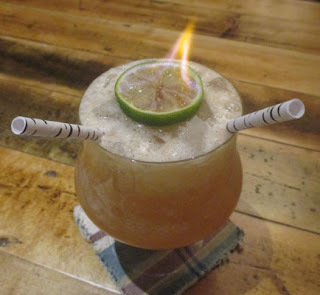 Add a pair of straws, and garnish with a floated spent half lime shell partially filled with Hamilton's 151 Proof Demerara Rum that was ignited. This drink serves 2 and can easily be scaled down for solo drinking as well as up for three-or-more-somes. It was pretty amazing the looks that were garnered as the drink was paraded across the dining room as well as the excitement on the faces of the recipient pairs. Indeed, one drink sold the next just from that flaming display (especially if it was at the two-top next to them). Part of the drink idea could be traced back to the Chappaquiddick where honey syrup and falernum were prominently matched together in a Daiquiri format. That duo has appeared in other drinks including the more recent Heaven is the Place as well as older ones like the Puka Punch. The pineapple juice also triggered the idea of pisco, and the San Francisco treat of Pisco Punch was solidified by Madame Lou's connection to San Francisco which is where she frequently visited and later died and where her tribute cocktail was first published. So thank you to Joel for getting us all to escape the winter doldrums by thinking about warmer days and instilling an escapist mentality. And thanks to all of the other Monday Mixologists who bought their plane tickets, packed their precious tools, glassware, and ingredients, and set off to participate in this event!